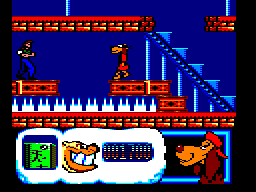 Hong Kong Phooey is an action-platformer that was also released on the Amiga, Atari ST, Commodore 64 and ZX Spectrum. Your task is to navigate a deserted Docklands warehouse in search of Baron Von Bankjob, who has escaped from jail. To defeat his army of thugs you can use punches and flying kicks, while the platforming segments can be negotiated by holding the fire button + diagonally-Up for a long jump. As a whole, the level design is good with an intricate layout that forces you to explore its rather sizeable scope. Plenty of tricky platforming challenges are available to test your skills, such as manoeuvring on a travelator before leaping over toxic waste, and there's even a section where barrels rain down as you try to climb upwards that's reminiscent of Donkey Kong! (1981, Arcades). However, it's not without its problems. For example, after heading downwards for a good few minutes to start the game it then forces you to backtrack to the very beginning in order to hit a switch; it's unnecessary and puts a temporary halt to the action and level progression. There's also a blind leap of faith at the end of the game, and unless you know to hold a certain direction on your descent you'll fall into an inescapable hole with no way out... a very cheap way to 'encourage' replayability! Although the developers did the best they could given the lack of available joystick buttons, the controls are a little clumsy and the need to press a button and then hold diagonally-Up to leap greater distances can lead to inaccuracy; it's certainly not game-breaking and you can adjust to a degree, but there will be times where you'll take unfair damage. The atmosphere does fall flat without music and only limited SFX, but the graphics and animation (especially when Phooey walks) are superb. Hong Kong Phooey is filled with untapped potential and its unfortunate control issues rear their ugly head far too often throughout the adventure. The level design does have some bright spots though and if you're a patient gamer who can look past the rather wonky inputs you might get some enjoyment out of this one. Random trivia: The 16-bit Amiga and Atari ST versions allow you to choose between music or SFX.